For budget lip pencils that pack a punch like their high-end counterparts, the Maybelline Color Drama Lipstick range is a definite must, especially when they're so budget-friendly at just £4.99 each. Fuchsia Desire is a stunning bold fuchsia pink that has lovely blue undertones, meaning it'll work well with most complexions. The formula for this range is absolutely heavenly and definitely one to check out next time you're near a Maybelline stand. Available in-store and online at www.boots.com. Jordanna is an American brand but you can actually pick them up the Modern Matte Lipstick range pretty cheap on Amazon for £2.62 plus £3.69 postage, although I'm sure if you're snazzy with your Internet searches, you could probably find them with cheaper postage. I have Matte Adorable and it's a really lovely baby pink that's great for a day-time lip in spring and summer, much easier to wear for those of you who aren't quite brave enough for a brighter pink lip. My favourite of all when it comes to a really bold pink lip is the Sephora Cream Lip Stain in Forever Fuchsia. The most wonderfully bright, bold and yet very, very wearable blue-toned pink that hands down beats any other pink lipstick I've come across. It's daring, but has the most gorgeous subtle metallic finish (and I mean super subtle) that makes it stand out, creating a stunning impact. Particularly love this one with a swish of golden bronzer and a soft contour. At £9.91, without a doubt the best range for liquid lipsticks! Available in-store and online at www.sephora.com. I will never stop raving about the Sephora Cream Lip Stain range and for me, the Sephora own makeup line is more than good enough to justify placing a Sephora order. Of course I'm still holding out hope that one day Sephora will re-launch in the UK and I can get my mitts on this range easier, but until then, they are more than worth the International order! 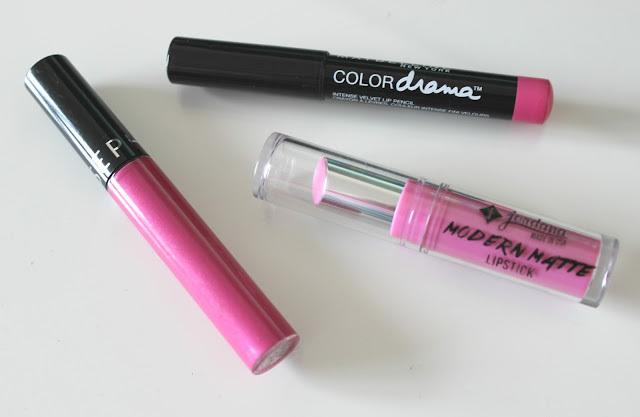 What's your favourite budget pink lip? The Sephora lip stains are one of my favourite lip products! The Maybelline color drama lipsticks look so nice! I'd love to try them out!